N.C. Cooperative Extension of Vance County is conducting a blueberry workshop on February 16, 2019, from 10 a.m.– noon at 2292 US 158, Oxford, NC (watch for signs). 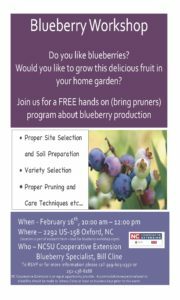 This workshop will cover topics such as site analysis and soil preparation, variety selection, proper pruning techniques, and other cultural practices used to grow blueberries. You will have the opportunity to practice your blueberry pruning techniques so bring your pruners. Bill Cline, NC State University Blueberry Specialist, will present the program and be available to answer any questions you have about blueberry production. If you have any interest in growing this wonderful fruit in your home garden, do not miss this opportunity to learn how to get started correctly. If you already have blueberry plants, learn how to get the best fruit production. To register or for more information please contact Johnny Coley (919-603-1350) or Paul McKenzie (252-438-8188).